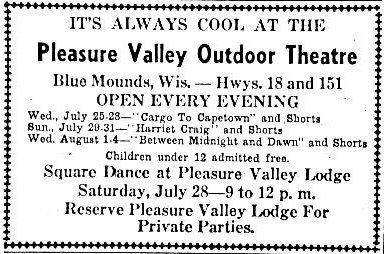 The Pleasure Valley Outdoor Theater was built in 1950 in the tiny town of Blue Mounds. 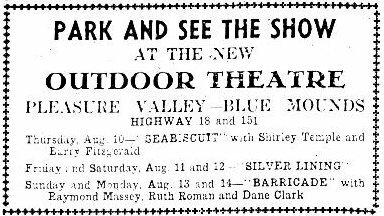 The theater was located north of Blue Mounds between the town and the entrance to Blue Mounds state park. The theater was located near the curve on the road on the south side. The theater was built as part of the Pleasure Valley Lodge that was on the other side of the road. The theater used a sound system similar to Maxwell's theater in Marshfield. There were large speakers by the screen, not individual speakers like in most drive-in's of the time. All traces of the drive-in and the lodge are completely gone.